Ace 7 Advisors has a new eBook describing a proven approach and best practices for corporate development intended for software company executives. 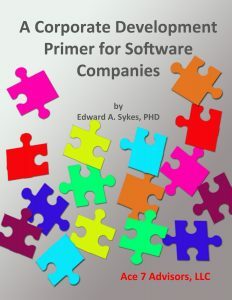 A Corporate Development Primer for Software Companies was written by Edward A. Sykes, a veteran in the software industry and accomplished in mergers and acquisitions. The eBook is based on Ed’s real-world accomplishments in corporate development in the software industry. Please complete the form below and click on the Submit button. You will receive an email with a link to a download page for the eBook. Contact Ace 7 Advisors Customer Support if you encounter any problems or need additional assistance.